Tracey Robertson is the Chief Executive Officer of Hoodlum, an Emmy® and BAFTA Award winning Entertainment Company she co-founded with Nathan Mayfield. 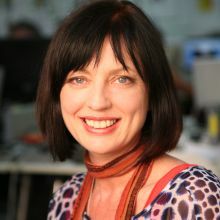 As CEO, Tracey oversees Hoodlum Television, connecting with networks and studios to produce scripted content in Australia, the United States, and the UK. Tracey currently resides in Los Angeles where she's been the head of Hoodlum's US office for the past four years. Tracey manages Hoodlum's US and International slate and has completed production of Seasons 1 and 2 of SECRETS AND LIES, a 10 part series for ABC Network starring Juliette Lewis, based on the Australian 6-part series created by Stephen M Irwin, as well as the FOX pilot STRANGE CALLS, a remove of Hoodlum's 2012 series THE STRANGE CALLS. Hoodlum is currently in production on Harrow, a 10 part series for the ABC Australia and ABC Studios International and is due to go into production on Tidelands for Netflix, a 10 part series which is Netflix's first Australian original. Robertson is a member of BAFTA, the International Academy of Telivion Arts & Sciences and the Australia Academy of Cinema and Television Arts (AACTA). She was recently recognized as an outstanding alumni and made an Adjunct Professor of Creative Industries at the Queensland University of Technology.